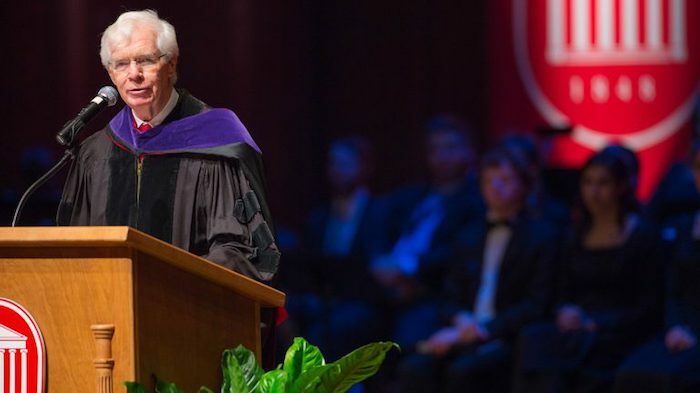 During its 165th Commencement on Saturday, the University of Mississippi honored former U.S. Sen. Thad Cochran with its Mississippi Humanitarian Award, which is presented only rarely to exceptional figures who have played a major role in shaping the state. Cochran, a UM alumnus, was first elected to the U.S. House of Representatives in 1972, and in 1978, he began a nearly 40-year career in the U.S. Senate – many of those years serving as the longtime chairman of the Senate Appropriations Committee, a powerful and coveted post on Capitol Hill. Time magazine dubbed the Pontotoc native “The Quiet Persuader” for his polite manner and knack for consensus building. He retired April 1 as the 10th longest serving senator in American history. “The University of Mississippi is dear to me, and I am humbled by this award,” said the senator, who wasn’t able to attend the ceremony. “It was an honor to serve Mississippi in Washington, and I am proud of our state’s progress to increase opportunities for its citizens. Chancellor Jeffrey S. Vitter said he is proud the university had an opportunity to recognize Cochran for his tireless support of its research efforts. “Honoring Sen. Cochran with the Mississippi Humanitarian Award is a tremendous opportunity to recognize his outstanding contributions to our university, our state and our nation,” Vitter said. “I’m grateful for the senator’s longstanding efforts to support and grow the university, especially our research enterprise. This is the fourth time the Mississippi Humanitarian Award has been presented since it was created in 2001. That year, it honored Jim and Sally McDonnell Barksdale. In 2003, former Gov. William Winter and his wife, Elise, were honored. The last winner of the award was Myrle Evers-Willams in 2013. Cochran majored in psychology and minored in political science at the University of Mississippi, and was the head cheerleader and a member of the Phi Kappa Phi honor society. After graduation, he served in the U.S. Navy and later returned to campus to earn his law degree. In 1978, the young congressman won an election to replace longtime U.S. Sen. James O. Eastland, who had retired. While he served in the Senate, Cochran held many leadership roles and journalists praised him for his focus on getting things done, rather than playing politics. His record of being re-elected to the Senate, six times, is a testament to the respect constituents had for him, Vitter said. Hurricane Katrina, often called the worst natural disaster in American history, hit in 2005 while Cochran was chair of the Senate Appropriations Committee. He was greatly affected by touring the devastation and vowed after seeing it to get whatever resources needed to help the Gulf Coast recover. He shaped the recovery of Mississippi and other devastated Gulf Coast states by using consensus building and bipartisanship to lead an initially hesitant Congress to offer an unprecedented $29 billion relief package. The funds included more than $5 billion in discretionary U.S. Department of Housing and Urban Development funds for Mississippi to help devastated homeowners. Those funds helped affected states recover from widespread damage to public and private property, the likes of which the country hadn’t seen before. Vitter announced the award Saturday in the Grove, just steps from the Thad Cochran Research Center, home of the National Center for Natural Products Research. The senator played a central role in the late 1980s in securing federal funding for NCNPR, and his efforts helped strengthen the university as an international leader in natural products research. Cochran also has been a strong advocate for numerous other campus research programs, which address many national needs, especially in national defense and agriculture. Those programs have helped UM become more competitive in securing research funding and have helped it earn the designation of being a Carnegie R1 Highest Research Activity institution, the highest ranking a university can attain in the Carnegie classification. It was also announced that the former senator is donating his papers to the university’s Modern Political Archives. Ole Miss is “deeply honored” to receive such an important collection, Vitter said. “These records not only document his years of service representing Mississippi in the U.S. House and Senate, they will also offer future researchers insight into matters of local, state and national significance,” Vitter said. Cochran’s impressive legacy includes giving Ole Miss students countless opportunities, and he has poised the state for a bright future, the chancellor said. “Although he retired in April of this year, his legacy will continue to shape the state of Mississippi for a long time to come,” Vitter said. “Sen. Cochran has been a great champion for the University of Mississippi.